Posted on January 10th, 2018. I had this really interesting chat with one on my tenants the other day, on renewal of their tenancy agreement. They are a lovely couple, early thirties and I know they have decent jobs in City. They have been tenants of ours for quite a while, so I know them quite well. We got talking and I enquired if they ever thought of buying a property for themselves, to which they replied back with the title of this article. It made me think and so I did some more research into the subject which I want to share with you. After the end of the Second World War, just over a quarter of the UK population owned their own home, the rest rented from private landlords or the local Council. If someone told you in the 1970’s and 1980’s that they rented, they were considered a second class citizen. Everyone wanted to own their own home…..it was the done thing. We think that home ownership will inevitably happen, but it won’t. It all changed in the 1970’s, when two things happened. Firstly, the number of people who owned their own home broke through the 50% barrier in 1971 and by 1981 it was at 57%. Tied in with that, the average house prices in Oakwood were doubling at one point every four years in the 1970’s so property and profit started to feed off each other. 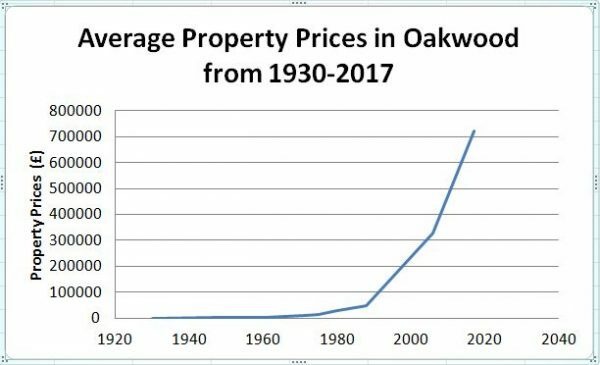 To put that growth in context, if we were to look at the last 85 years in Oakwood, in 1930, the average Oakwood property was worth £750. It took 16 years for Oakwood property values rising to £1500 by 1946. Another 15 years and the average Oakwood property rising again to £2000 in 1961. The next doubling only took 10 years, as by 1971 the average Oakwood property had reached £10,000 in value. It was (as mentioned above) the 1970’s when things really took off, as by 1975 (i.e only four years) they had climbed to £15,000 and they doubled again to £30,000 by 1980. It took another eight years for values to double again, as an average Oakwood property reached £50,000 in 1988. Twelve years had to pass until they doubled again in 2000 (£) and just six years to double again by 2006, when they reached £330,000. Where are we today? The average property value in Oakwood currently stands at £720,000. We could blame Maggie Thatcher for making home ownership the ultimate goal, but what we now need to consider is that the country is turning on its head and we need to, as a Country, love renting again. Some blame the banks, but obtaining a 95% mortgage is hard work, but nowhere near impossible. A typical Oakwood first time buyer would only need to save £64,000 and part of these costs includes stamp duty and solicitors fees. For example, you could buy a property in Lonsdale Drive in Oakwood, and it would be cheaper each month in mortgage payments than renting. If you are looking for an agent with experience that can help you find the right purchaser or tenant for your property, then contact me to find out how we can get the best out of your home or investment property. You can email me [email protected] or give me a call on 020 7435 0420. Pop in for a chat – we are based at Ashmore Residential, 5 Netherby Gardens, Oakwood, Enfield, EN2 7PA . There is plenty of parking and the kettle is always on.